Today I'm making an American Brown ale in the new Nashville brewery. The space is larger than the one I had in Memphis and there is a cool bonus. 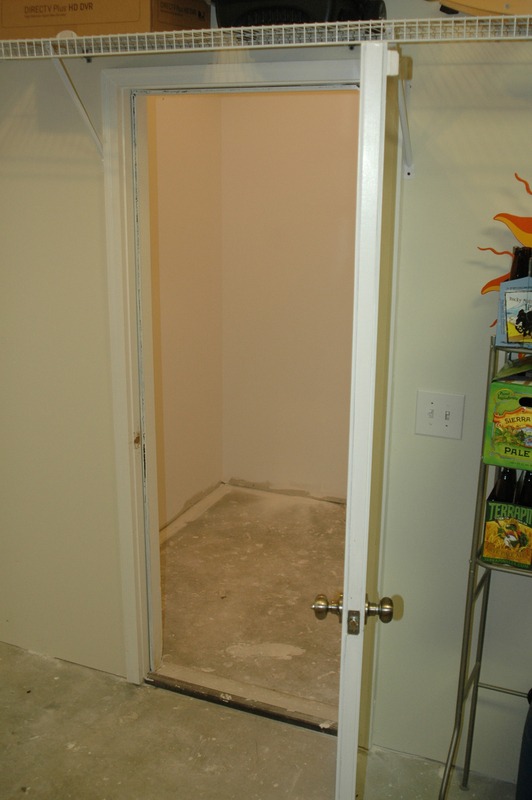 Whoever refurbished this place built me a nice beer room right in the middle of the floor plan. It's about 6 by 6 and has a can light in the ceiling. I can't wait to fill it up. Shelves will need to be erected first. I've decided to taste a few beers made here before I start messing with the water. I might not need to do much of anything to it but we'll see. The first beer I made in here was an extract pale. It's not my best work, but considering the old hops I was using and a limited control over some of the ingredients, it tastes pretty good. The only problem with this house is that the kitchen is all the way upstairs with a sink that does not lend itself to the bottling process. It looks like I'm going to have to find a way to accomplish that right here with the cold water supply and no sink.